In December 2018, the UN is expected to formally adopt the “Global Compact for Safe, Orderly and Regular Migration (GCM)” in Morocco. The GCM will be the first global framework to comprehensively address issues related to the hundreds of millions of people in the world who change their country of usual residence (with the exception of refugees). The agreement between states is expected to present a framework for comprehensive international cooperation on migrants and human mobility. In addition, it will deal with a broad number of aspects related to international migration, including the humanitarian, developmental, human rights-related and more. In this month’s “Voices from the South,” Aaron Ceradoy of the Asia Pacific Mission for Migrants (APMM) in Hong Kong describes the GCM, outlines some of its strengths and flaws, and points to advocacy goals from the perspective of grassroots migrants. In front of all member states during the opening plenary of the UN Summit on Migrants and Refugees, Lestari who chairs the International Migrants Alliance (IMA), threw down the gauntlet for governments to take action on human rights concerns of migrants, rethink the flawed migration for development frame, and recognize the position and enable the presence especially of grassroots migrants in charting the future of migration. Almost two years later, the Global Compact on Safe, Orderly and Regular Migration (GCM), which was initiated by States at the same UN summit where Eni spoke, is nearing its finalization and is scheduled to be adopted in an intergovernmental conference in Morocco in December 2018. Three drafts have so far been released, yet the GCM still leaves a lot to be desired. Although the GCM is expected to detail a long list of human rights of migrants, which is a positive, it falls short in detailing actions that need to be taken to ensure that states will ensure these rights. States are not legally bound by the compact, and the sovereignty card is arbitrarily waved around especially on matters of each State’s own border restriction. It also does not effectively address the criminalization of migrants who are currently in an irregular situation. The GCM also starts in a weakened position internationally. 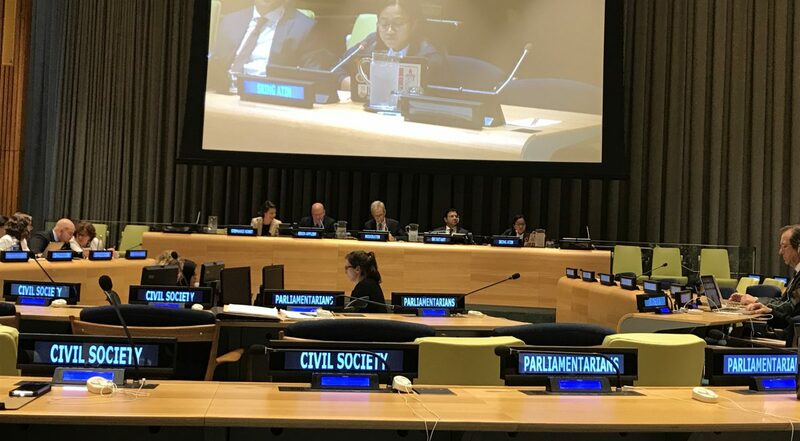 Notably, the United States – presently notorious for rising xenophobia and discrimination – has withdrawn itself from the Global Compact’s negotiations. Such withdrawal does not bode well for the millions of migrants working and residing in the US. – It does not look at the root causes of forced migration. While the GCM seems to include the drivers of migration as part of the objectives, discussions on their resolution merely skirt around the real issues. This relates to (among other things) the lack of accountability of the rich and powerful countries in the impoverishment of the poorer countries, the plundering of environment, and conflicts in countries of origin of migrants that lead to forced migration. – It treats migrants as commodities that send remittances back to their home countries. The GCM is in denial of the existing labor export programs of migrant-sending countries. In fact, it aims to further develop, protect and promote labor export policies in the name of increasing remittance for development. As it stands now, the GCM is perilously close to being just another unenforceable document with a spattering of positive statements that leave migrants still in a condition of modern-day slavery and commodification. It enforces neoliberalism as a development strategy and as a migration frame to ensure the flow of cheap, skilled, vulnerable and disposable foreign workers from perpetually underdeveloped countries. As the GCM nears its completion with the last negotiations scheduled in July (and its adoption in December), the migrant movement is challenged to shape the compact into an instrument that can address real problems. We do not want another perfunctory document devoid of real impact. We must campaign more extensively and intensively in the countries who will be adopting the agreement, lifting up concrete issues of rights of migrants, as this will remain the barometer of whether states effectively address migrant’s problems (with or without a Global Compact). We must persistently educate, organize and mobilize the migrant workers themselves to embrace the struggles for their rights and wellbeing, and the end to forced migration. We must also intensify the ever-expanding movement of grassroots migrants. From the national to the global level, the direct participation and leadership of grassroots migrants must be ensured whether in campaigns or lobbying activities. In her speech, Eni Lestari said, “do not talk about us, without us.” These are not mere words but carry a powerful message not only of inclusion, but a call for recognition that talks about migration revolve around the lives of these workers, women, youth, children and the multiple exploited and vulnerable sectors among migrants. In the end, the problems of migration and of migrants go well beyond what the GCM professes to address. The migrant movement itself must raise the discourse on migration to hit the roots of migrant’s issues – neoliberal economics and politics, and wars and conflicts perpetuated by the monopoly capitalist businesses and states.